Redoubtable presidential aspirant, Atiku Abubakar, emerged candidate of the Peoples Democratic Party, PDP at its just concluded national convention. Arguably, the party has put its best foot forward. 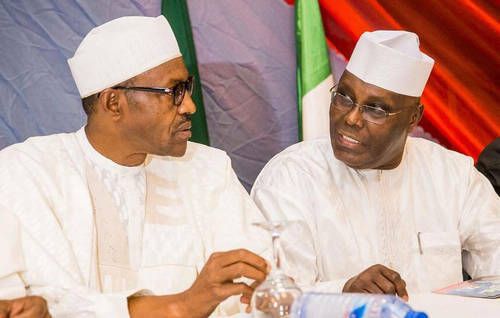 A dispassionate analysis of the choices before the party shows that many of the other aspirants either carried more ethical baggage than Atiku or did not pack the kind of punch that could dislocate Buhari’s political jaw. The margin was overwhelming in a field that boasted 13 contestants – Atiku: 1532; Datti: 05; Bafarawa: 48; Dankwambo: 111; Jang: 19; Kwankwaso: 158; Lamido: 96; Makarfi: 74; Mark: 35; Saraki: 317; Tambuwal: 693; Tanimu: 65; Void: 68. The total number of accredited voters was 3221. Discounting voided ballots, Atiku cleared about 49 percent of the votes. Put another way, Atiku scored as many votes as all the other aspirants put together! He was by far the overwhelming choice of the delegates. His off-the-cuff acceptance speech was a deft verbal construct to massage the bruised egos of his co-contestants and their sponsors, reach out to old foes like Olusegun Obasanjo who he graciously eulogised and generally rouse his partymen and women to rise to the challenge of the task of “getting Nigeria to work again”. One day earlier, in Abuja, President Buhari had accepted his nomination by the All Progressives Congress, APC, to fly the party’s presidential flag again in 2019. Buhari had secured about 14.8 million votes in APC’s direct primaries held nationwide which the 7,000 odd delegates gathered in Abuja affirmed. The die is cast. Atiku described the Buhari government as clueless. Buhari describes PDP as the very evil Nigerians must avoid. There are interesting days ahead, no doubt. Atiku had been carefully building narratives around some of the major contending issues that are bound to be major determinants in the run-up to the elections – political restructuring, economic re-engineering, social cohesion. Rather than dismiss Atiku with a wave of the hand, APC bigwigs had better realised that the man is actually PDP’s best foot forward at this time. Underestimate him at your peril. Witness how all the internet tigers hyped on social media as leading PDP contenders melted before the furnace of Atiku’s political machine! Somehow the political class across the divide managed to swing their various conventions this time without depopulating the land as was their wont in previous years. The party primaries have been largely peaceful, even if some looked like the very definition of mandate pilfering. But the masses seemed to have enjoyed the week of drama, dance and excitement- and the attendant surprises in places where some Goliaths fell by the people’s sword. Can PDP keep its house intact after the presidential primaries? The indications are that the party could manage to do that now that it has a tested gladiator as its presidential candidate. APC would be hoping to profit from any cracks, having lost its own members to the PDP in the carpet-crossing gale masterminded by senate president Bukola Saraki and Speaker Yakubu Dogara. The way Governor Nyesom Wike took his leave after his candidate, Tambuwal was beaten by such a scandalous margin, gave cause for concern. But insiders say nothing was amiss and that it was natural for Wike to feel dejected after his candidate lost. As a good party man, he had congratulated the winner, Atiku Abubakar. A similar fear hag around the fortunes of APC after some notables failed in the recent primaries. Will some of them team up with the PDP in a re-enactment of what some PDP members did to their party in 2015 when they teamed up with the opposition to throw their former party out of power? As always, in Nigerian politics, never say never. Atiku seems primed for political duel. He tasked his party members to concentrate on solutions to Nigeria’s many problems instead on just parroting a list of challenges. Obviously, he wants the coming elections to be solely about issues. APC had better got its position on restructuring ready. It had better put out a clear economic blueprint and its candidate guided in how professionally packaged messaging plays out. Right now, that is not being done. It is better done in a rehearsal than as post-mortem. For the PDP, there is still the little matter of rebranding. Don’t think that by simply apologising to Nigerians, they have lost memory of the reason they voted you out in 2015. You’ve got to rebrand! I chuckled when I heard Atiku say the party has been rebranded. If you want to win the 2019 elections, you’ve got to influence the voters’ perception of your party, its programmes and candidates by revitalising your brand, making it appear more relevant and deserving of trust. Enough said. We can’t wait for the bout to begin. In the red corner is Atiku, the 71-year-old son of a Fulani trader and farmer named Garba Abubakar from Jada village in Adamawa State; in the blue corner is Muhammadu, the 75-year-old son of a Fulani father, Hardo Adamu from Daura, Katsina State.